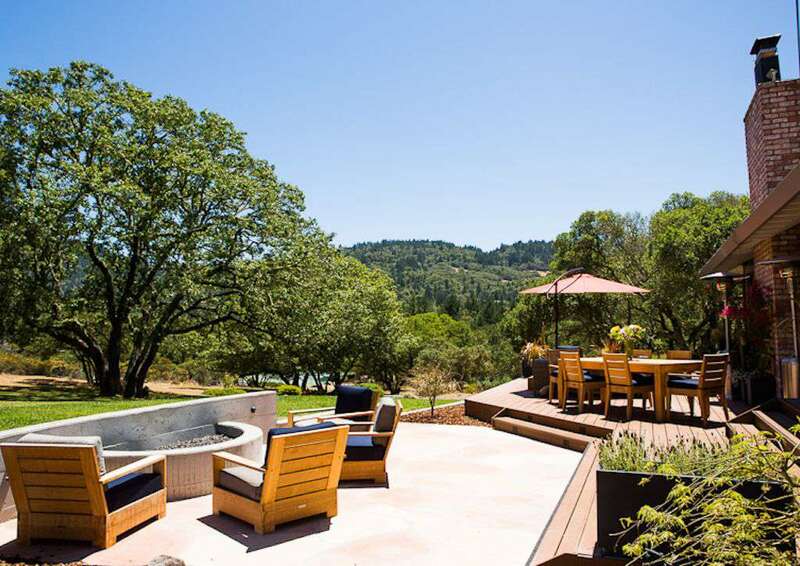 Modern luxury meets Napa Valley Wine Country ranch style in this beautifully 17 acre property nestled in a private valley in the Mayacamas Mountains 1,200 feet above Calistoga. This Mayastoga Property Group home is an elegant yet comfortable fully updated and beautifully decorated 6br/6ba modern ranch-style home on the border between Napa and Sonoma Counties. The ranch is within minutes of the best of both Napa and Sonoma wineries and is the perfect place for family reunions, groups of friends, or companies looking for a private, yet accessible retreat. This property is managed by Mayastoga Property Group, which provides all renters with complementary concierge services. Walking into the home you'll be immediately impressed by the warm oak flooring accented with beautiful art and mid-century modern touches. The main gathering area to the right as you walk in includes a slate fireplace, large Italian sofa and designer finishes as well as a second seating area with four club chairs overlooking the grounds with large Live Oak trees. The adjacent dining area comfortably seats 12 and is also steps away from the fully stocked chef's kitchen, set apart by a 165 year-old 5" slab of California Walnut used for additional seating or a convenient serving area. With its commercial sized refrigerator and freezer, two dishwashers, 150 bottle wine refrigerator, Miele automatic coffee maker, and virtually every small appliance imaginable, any chef will love this kitchen! The home includes six large suits, each with its own private bath. Five of the suites have King Beds with extremely comfortable mattresses and linens. One suite has two queen-size beds for additional sleeping capacity. The bathrooms are fully stocked with luxurious Restoration Hardware towels and Napa Valley Soap Company bath amenities. Four of the bedrooms have 44" wall or furniture-mounted LED TVs with DirecTV. All have blackout drapes for complete privacy and comfort. The home has a 3-zone central air and heat system, Wi-Fi, DirecTV, and a Sonos sound system that channels your music throughout the home, as well as on the front patio and rear pool area. The outside backyard of the property includes a 1-acre fenced area with large, deep fully modern solar heated pool with built-in lounging deck and spa surrounded by Restoration Hardware furniture and numerous shade umbrellas for relaxing days. By the pool area is a large Weber propane grill. Sonos speakers provide the opportunity to create that perfect ambience! The front deck is also complete with Restoration Hardware outdoor sofa, dining table and lounge chairs for relaxing and enjoying the view of the spectacular Mayacamas Mountains. Along with the Sonos speakers, umbrellas and propane fire pit, it's the perfect place to relax in the sun listening to your favorite artists, enjoy breakfast as the sun comes up, or entertain guests for a truly spectacular gourmet dinner. Down the walkway is a regulation-size newly refinished tennis court. The property comes complete with ample sports equipment, hiking trails, tree swing & hammock and so much more. Our amenity and cleaning fee includes preparation of the property prior to arrival and thorough cleaning upon departure, pressed bed linens, Napa Valley Soap Company shower and bath amenities in all bathrooms, thick bath & pool towels, sports equipment, pool amenities (pool toys, hats, sandals, sun screen, sun glasses), and electricity and propane. We've heard from so many who have rented this property that they originally arrived with restaurant reservations for each night of their stay only to end up canceling them and staying in to cook and enjoy the private time. They just didn't want to leave the property! As a result of loosing our other home during the 2017 fires, we have built a small owner's home on the property. The "Modsita" as we call it is located down by the tennis court and away from the main house, so your privacy at the ranch can be assured. Need more rooms? Mayastoga owns and operates additional accommodations in the immediate vicinity should your group require additional space. Please ask about out other Mayastoga properties. Mayastoga is pleased to provide all guests with our Mayastoga Wine Country Concierge. Your concierge will help plan and manage your visit to our distinctive property California’s northern Wine Country. Itineraries can include boutique and hard-to-access wineries, local restaurant reservations and transportation, as well as special touches that make for a truly memorable adventure. In addition to your tasting days, arrangements can include evenings in the comfort of your luxury residence with a private chef, a guest winemaker, or a cheese tasting and pairing with an internationally recognized food and wine expert (or all of the above!). Of course, there are numerous activities in addition to wine and culinary plans that are regularly arranged for our clients that include unique local attractions and activities (including our “Kids Country” itineraries)..
LEGAL VACATION RENTAL: This property is a registered and legal Vacation Rental through Sonoma County. Our Vacation Rental Permit number is ZPE14-0269 and our Transient Occupancy Tax (TOT) number is 1304N. ALSO, we DO NOT ask you to wire any money. If you are asked to wire money to anyone it is more than likely a VRBO scam so DO NOT let this happen to you! Quiet Hours as mandated by Sonoma County Code Section 26-88-120 are between 10p and 7a. This property has 1 King(s), 4 King(s), 2 Twin(s). We were a group of 6 couples celebrating a 50th birthday in wine country. The house was absolutely perfect. I loved that each bedroom had its own en suite bathroom. Kitchen had everything you could possibly need and then some! Outside the house was great as well. Unfortunately it was rainy while we there so didn’t get to fully enjoy that, but we had a fabulous time in spite of that. Arthur was a great host and took care of anything we needed promptly. I would 100 percent recommend this property. Firstly the location is stunning. The house was beyond fantastic and the care that Arthur the property owner took was to perfection. I would go back again and again and recommend it to family and friends. An experience I will forever cherish! The house is equipped with the latest tech and is sparkling clean. The surroundings are stunning and Arthur was incredible resposive and welcoming. We stayed as a group of 10 for a wedding and are definitely planning to coming back! The house is surely even nicer in spring / summer / autumn when you can use all the comfy outdoor furniture, the grill and the pool. But we came in winter with cold weather and rain and still loved it. The house offers so many inside opportunities to spend quality time as a group like in the huge kitchen, the dining table or the living room in front of a cozy fire or even the private tennis court. We were lucky enough to find this amazing house to host all of our friends for a great birthday weekend! Arthur was a wonderful host and the house was equipped with everything we needed. Excellent on all counts. Beautifully appointed. As comfortable as home, if not more so. All situated in a spectacular setting. Wish we had been able to stay longer to enjoy this incredible property. My family’s stay at the Mayastoga Wine Country Ranch exceeded our expectations! The house and property blew us away and look even better in person than in the photos. Arthur was always attentive to our needs before, during and after our stay at his beautiful home. This house made our family gathering even more special and the amenities were terrific! Thank you again Arthur, we hope to be back soon! From the moment we arrived, our first impression was wow. All of the amenities from the 6 bedrooms/bathrooms, pool, firepits and grounds were immaculate and welcoming. We would definitely stay here again. A beautiful home on a gorgeous piece of property! We loved our stay for a family wedding in Calistoga (an easy drive from the house). We all enjoyed our morning coffee while watching the deer roam the vast 17-acres and were thrilled to be welcomed home in the evenings to a family of jackrabbits. The pool, hot tub, gourmet kitchen, sound system, fire pit, and interiors exceeded everyone’s expectations. This is a magnificent property for a family vacation or couples trip. We hope to return in the near future! What can I say: the home is simply amazing and immaculate. Arthur, the property manager, is incredibly detail oriented. Home was stocked with everything we need with high end appliances, furnishings, cookware and everything you need to have a fantastic get together. Really enjoyed the art and decor as well -- I would like to describe as comfortably modern and eclectic. You can tell that Arthur really put a keen design eye to it or hired a great designer. Landscaping was recently done and the pool is amazing. Meanwhile, Arthur was very accessible and quick to respond to our needs. Would definitely stay here again. What can I say: the home is simply amazing and immaculate. Arthur, the property manager, is incredibly detail oriented. Home was stocked with everything we need with high end appliances, furnishings, cookware and everything you need to have a fantastic get together. Really enjoyed the art and decor as well -- I would like to describe as comfortably modern and eclectic. You can tell that Arthur really put a keen design eye to it or hired a great designer. Landscaping was recently done and the pool is amazing. Meanwhile, Arthur was very accessible and quick to respond to our needs. Would definitely stay here again. We were a family group of 14 with five kids 13 and under. All of us had a grand time. We especially enjoyed wildlife viewing including deer and jackrabbits. Our magic time was sunset and twilight on the terrace off of the living room. Tripping the light fantastic! The pool was kid central and we appreciated the numerous pool toys and lounges as well as shaded seating. Good kitchen particularly well furnished with all the bells and whistles. Pantry is super well furnished with almost any condiment, herb and spice. Decor is contemporary, lots of Restoration Hardware. If you are older souls with iffy knees and hips, be aware the living room furniture is low to the ground with concomitant stress on wonky joints. Beds and linens nicely comfortable, towels thick, bathrooms pristine. We arranged maid service three times during our week-long stay and were glad we did as we were such a large party. Rosa is the bomb! Arthur was exceptionally helpful and very clear about renter responsibilities. We were a family group of 14 with five kids 13 and under. All of us had a grand time. We especially enjoyed wildlife viewing including deer and jackrabbits. Our magic time was sunset and twilight on the terrace off of the living room. Tripping the light fantastic! The pool was kid central and we appreciated the numerous pool toys and lounges as well as shaded seating. Good kitchen particularly well furnished with all the bells and whistles. Pantry is super well furnished with almost any condiment, herb and spice. Decor is contemporary, lots of Restoration Hardware. If you are older souls with iffy knees and hips, be aware the living room furniture is low to the ground with concomitant stress on wonky joints. Beds and linens nicely comfortable, towels thick, bathrooms pristine. We arranged maid service three times during our week-long stay and were glad we did as we were such a large party. Rosa is the bomb! Arthur was exceptionally helpful and very clear about renter responsibilities. The property is perfectly situated for easy access to all that the wine country has to offer. And it is beautifully outfitted, with everything that you need to have a lovely vacation. We come to the wine country every year with a group that ranges in age from 10 to 91. The house works perfectly for everyone — with plenty of open space and places for people to be quiet and, alternatively, to have fun. Arthur is a pleasure to work with, and did everything possible to make our stay a great one. Could not recommend this house more highly. This house is Amazing! It accommodated our group perfectly. Everything you need is right there for you and the location is great!!! We would definitely stay at this beautiful home again! Well equipped. Spacious, lots of privacy. Great location. This is the perfect spot for a family reunion with grandchildren from four to fourteen! The open living area, spacious lawn and wonderful swimming pool provide ample space for everyone to play and there is plenty of outdoor seating front and back with large umbrellas and heat lamps. We love the quiet rural environment but only a 10 minute drive to Calistoga. Plenty to do in the area: Safari West, horseback riding, and wineries for family picnicking. Arthur is always available to answer questions. A five star experience and our second time at this property. This is the perfect spot for a family reunion with grandchildren from four to fourteen! The open living area, spacious lawn and wonderful swimming pool provide ample space for everyone to play and there is plenty of outdoor seating front and back with large umbrellas and heat lamps. We love the quiet rural environment but only a 10 minute drive to Calistoga. Plenty to do in the area: Safari West, horseback riding, and wineries for family picnicking. Arthur is always available to answer questions. A five star experience! From the first contact with the owner, to the smallest details of the home, this was an excellent experience. The owner is extremely responsive and helpful, he usually responds within a few hours. We were a group of 10 adults, comprised of 5 couples, and the floorplan was ideal. It’s difficult to find a layout or a home that has amenities where everyone feels they stayed in equal or even rooms, but this home has that to offer. All of the bedrooms are en suite, the linens are high quality, the decor is beautiful. The main living areas are welcoming and easy for a group this size. We used the kitchen extensively, had a BBQ one night, spent time in the pool, by the fire pit, really just enjoyed all of the lovey spaces that the home has. The location was also good for our group. It’s just 10 minutes from Calistoga, quiet and remote enough that we appreciated the privacy. We spent one day wine tasting and had endless options for great wineries and delicious restaurants. This is by far the best rental property. Beautiful spacious home, enviable decorating, perfect temp pool, wonderful grounds and surrounding neighborhood. Extra amenities to support aging parent. Well stocked kitchen. Perfect getaway! The home and property are immaculate. When on vacation, it is so nice to stay at a place as nice, or nicer, as your own. This home met that requirement and then some. From the super comfortable bed, amazing shower, and built-in espresso machine to the incredible hot tub, pool and fire pit, this place was incredible. Arthur is the nicest guy ever and took care of every detail. Thank you, Arthur, for sharing your beautiful home. We hope to be able to return many times. This house is SPECTACULAR!! You will pinch yourself just to make sure you haven't died and gone to heaven. Arthur, the owner, has created a home that shines in every room. The décor is amazing. Pool, hot tub, sitting areas, hammock, tennis courts.....kitchen!! It was a stay in which my JOYloc group will remember forever. We were a group of ten women getting away from home for the weekend in wine country, and the house and property are simply spectacular! Arthur met us at the house, and showed us the basics which was very helpful later on as we went to use various amenities. Each bedroom has it's own private bath and the best beds and linens I've ever experienced in a rental property. The house is spacious and has everything that you need. The property is a bit out of the way but that actually made it even better as the majority of us went out running through the mountainside before hitting the wineries! I would definitely recommend the house to anyone visiting the area....and I hope to be back in the future! This is one awesome property/home. We had a very large party and there were enough room for everyone. Everything in the house is top-notch - the TVs, linen/bedding, washing machine and dryer, kitchen equipment and wireless hookup (also, the kitchen ihas all staples you would need). The hot tube and pool was very nice. The grounds a beautiful with wildlife present. In addition, the owner was very, very helpful and available in a moment notice to address any question (before stay and during). Would highly recommend this property. Cannot go wrong renting this property. Our extended family (13 adults, an infant and a toddler) enjoyed a wonderful stay. The house is very well appointed - great kitchen/bedding/bath supplies and the outdoor set up is pefect for relaxing. Plenty of umbrellas, great seating options in the front and back yards. Music speakers throughout the house and outside. The pool is pristine and there are plenty of beach towels and outdoor chairs that you can take into the shallow end of the pool - very nice! We also had permission to host a private party on premise for about 45 people and there was plenty of room. The owner is very easy to work with and the house is immaculate. We would definitley stay again. PS - an unexpected benefit. . .deer feeding on the front lawn in the mornings and afternoons. A real treat! I wish we could have stayed another week! Our extended family (13 adults, an infant and a toddler) enjoyed a wonderful stay. The house is very well appointed - great kitchen/bedding/bath supplies and the outdoor set up is pefect for relaxing. Plenty of umbrellas, great seating options in the front and back yards. Music speakers throughout the house and outside. The pool is pristine and there are plenty of beach towels and outdoor chairs that you can take into the shallow end of the pool - very nice! We also had permission to host a private party on premise for about 45 people and there was plenty of room. Arthur, the owner is very easy to work with and the house is immaculate. We would definitley stay again. PS - an unexpected benefit. . .deer feeding on the front lawn in the mornings and afternoons. A real treat! I wish we could have stayed another week! Thanks Arthur. What a fantastic property. We were 4 couples, and we couldn't have found a more perfect residence. Everything you can imagine plus more: beautiful linens, towels, robes, and bath amenities. The kitchen was awesome; every tool, pan, or gadget one might need. Lots of dishes, wine glasses (of course), outdoor ware, and more. The pool and hot tub are spectacular including towels, hats, and flip flops. Our favorites were the two fire pits... just lounging around in the evening enjoying life and one another. The house is large, space for everyone. Three bedrooms one one side, three one the other, so everyone is spread apart. And nature outside the windows every day - deer, quail, jack rabbits, fox and even skunks. Arthur is the consummate host. Answered many questions and helped us several times. Thanks for sharing your Calistoga Mountain Ranch with us... we hope you'll have us back. The house was impeccable. It had everything you could ever think you might need and it was well laid out for a group of friends with and without kids, with plenty of different hang out spaces and a giant kitchen. I would highly recommend and will definitely keep it in mind for our next Napa/Sonoma trip! I never write reviews, but for this property it was impossible not to do so. We were 9 adults and 5 children and all of us loved the house, pool, tennis court and location. The kitchen was incredible and had everything you could ever imagine needing to cook any meal. Ample indoor / outdoor seating for meals / lounging, common space, etc. Somehow we all felt close yet never crowded and with many options for privacy. We are already planning our return! We were a large group - 6 adults and 7 children -- and were incredibly comfortable. The house is spacious and well appointed - we never wanted for anything: the yard and pool were incredible and the kitchen was completely stocked with everything we needed. It's also conveniently located - close to a few great towns and a short drive to many wineries. The Mayastoga host was a lovely host - communicative, helpful and incredible generous We didn't want to leave! We were a party of 12 Brits over for a wedding in nearby St Helena so used all the rooms in the house. Without exception all were delighted with the house which is very well appointed and comfortable. Although the place was "full" it did not feel at all crowded as the individual bedrooms are spacious and comfortable and there are 2 seperate outdoor areas, plus a big lounge area, so we were not penned in together at all times. Also, it was very hot while we were there ( by Northern European standards anyway) so the pool was well used. It is salt water based rather than chlorine or some other chemical which was appreciated. Also, the very efficient and quiet aircon inside was a big plus. We had agreed that the nights we were in that there would be an appointed chef who would cook for the house...which is when we realised how well equipped the kitchen is so some top class cooking was delivered. All in all a genuinely good experience; understated luxury, everything worked and on the 2 occasions when we had minor issues Arthur was super-responsive which was appreciated. The only downside was that when we wanted to visit Calistoga (great little town) the Uber drivers had difficulty finding the place so we had to wait a while. A small price to pay for the peace and solitude of such a beautiful location. We were a party of 12 Brits over for a wedding in nearby St. Helena so used all the rooms in the house. Without exception all were delighted with the house which is very well appointed and comfortable. Although the place was "full" it did not feel at all crowded as the individual bedrooms are spacious and comfortable and there are 2 separate outdoor areas, plus a big lounge area, so we were not penned in together at all times. Also, it was very hot while we were there (by Northern European standards anyway) so the pool was well used. It is salt water based rather than chlorine or some other chemical which was appreciated. Also, the very efficient and quiet aircon inside was a big plus. We had agreed that the nights we were in that there would be an appointed chef who would cook for the house...which is when we realised how well equipped the kitchen is so some top class cooking was delivered. All in all a genuinely good experience; understated luxury, everything worked and on the 2 occasions when we had minor issues our host was super-responsive which was appreciated. The only downside was that when we wanted to visit Calistoga (great little town) the Uber drivers had difficulty finding the place so we had to wait a while. A small price to pay for the peace and solitude of such a beautiful location. We stayed at this house in June and I can't say enough good things about this house. Very luxurious and it has everything you can think of. Our family stayed there with my sisters family and we had more then enough space and things to do for everyone. I would highly recommend this property! The host is the best to work with. He goes out of his way to make sure you have a perfect stay at his house. Thanks again Mayastoga! For more than a decade, we have been renting houses in the bay area and this Calistoga home is the best! Perfect location. Great walks, biking and Calistoga is a quick drive over the hill. The house is well designed, high quality and private. The owner has thought of the little details that make a difference- lots of extra towels for the pool, well stocked kitchen with enough dishes, and the second dishwasher is always appreciated with a large group. Perfect getaway! This beautiful property was a home away from home but only better. Travelled to Napa for business and this home made our stay. The homeowner was fantastic and we thoroughly enjoyed our stay. 10/10! This is home is unbelievable. We could not have asked for anything more from a rental property. It far exceeded our expectations. The photos do not do it justice. Arthur is the perfect host and is beyond thorough when making sure you know where everything is and how all the electronic devices work. He truly wants you to enjoy his home and goes out of his way to ensure you do. The house is fantastic. Upon your arrival you are not only stunned by the exceptional décor and cleanliness but by the beauty of the landscaping and views. The house comes equipped with everything imaginable. The kitchen is fully stocked; the sound system is awesome. There are robes, toiletries, cookbooks, comfortable beds and beautiful linens, pool towels, sunscreen......everything. We did not want to leave the house and were always happy to come home and jump in the pool/Jacuzzi after a day of wine tastings. You will not regret renting this property and will spend your time trying to figure out when you can return. Thank you Arthur for making a stay enjoyable. Your home belongs in Architectural Digest. This was a quick getaway for us to visit Napa to enjoy its numerous wineries and amazing restaurants. The home slept 8 of us comfortably and luxuriously. Every detail was thoughtfully appointed - making it a great place for 4 couples to enjoy both privacy and communal facilities. The grounds were amazing and secluded. I look forward to making a return visit - I just cannot imagine a better home for a small group of adults. This was our first trip to Napa Valley. We had 4 couples staying in this home. Each couple had their own bedroom and bathroom. We had plenty of room to move around. Linens and bath towels down to the soap were amazing. Gourmet kitchen was incredible. Fully equipped with anything you would need. It was very clean and comfortable. Outside patios, decks were amazing. It was a beautiful house to stay in. It didn't not seem like a rental property. It was in a very private picturesque setting. I hated to leave. We even got to meet Arthur and told him how much we loved his home. This was our first trip to Napa Valley. We had 4 couples staying in this home. Each couple had their own bedroom and bathroom. We had plenty of room to move around. Linens and bath towels down to the soap were amazing. Gourmet kitchen was incredible. Fully equipped with anything you would need. It was very clean and comfortable. Outside patios, decks were amazing. It was a beautiful house to stay in. It didn't not seem like a rental property. It was in a very private picturesque setting. I hated to leave. We even got to meet the host and told him how much we loved his home. Recommended for: Families with Young Children, Pet-friendly, Sightseeing, Girls Getaway, Adventure Seekers, Age 55+, Families with Teenagers. I needed a large home for a group of CEO's to spend several days together enjoying wine, food, and some meetings. The home laid out perfectly to accommodate (7) of us. We brought in a chef and took advantage of the large, modern kitchen. We enjoyed the pool, the tennis court, the weights in the garage. One night we brought in karaoke on the back deck. When we woke in the morning we saw rabbits and deer roaming the property in pristine natural silence. The pictures of the home can't do it justice and the discriminating team I brought with me kept complimenting me on the quality of the house I selected. Home was well stocked and the check-in, check-out was flawless. Best rental we've ever had. Recommended for: Families with Young Children, Girls Getaway, Adventure Seekers. I rented Arthur's gorgeous house to host about a dozen friends (including 3 seven year olds) for my 50th birthday weekend. - Fantastic house: Beautiful, quiet and amazingly appointed from top to bottom. - Fantastic host. Responsive and all the recommendations we needed. I rented this gorgeous house to host about a dozen friends (including 3 seven year olds) for my 50th birthday weekend. - Fantastic house: Beautiful, quiet and amazingly appointed from top to bottom. - Fantastic host. Responsive and all the recommendations we needed. Highest recommendation!! I had the highest of expectations, and they were exceeded in everyway. This home is stunning - far more beautiful than the pictures capture. It is perfectly laid out for a large group of people to have plenty of space and privacy, and the setting is magical. Something that is difficult to grasp from a website is how special the homeowner is. He stocked this home with every imaginable thing you could want (or had forgotten), and his extraordinary attention to detail was evident in every way. I would return to this home every year for the rest of my life if I could with family, with friends, basically with anybody. I had the highest of expectations, and they were exceeded in every way. This home is stunning - far more beautiful than the pictures capture. It is perfectly laid out for a large group of people to have plenty of space and privacy, and the setting is magical. Something that is difficult to grasp from a website is how special the homeowner is. This home is stocked with every imaginable thing you could want (or had forgotten), and his extraordinary attention to detail was evident in every way. I would return to this home every year for the rest of my life if I could with family, with friends, basically with anybody. We rented the house for a team offsite and retreat - a mini work vacation after a long couple months and as a way to build team morale and reconnect as a team. And the house was just perfect for this use. It was the perfect place to be able to work but also be able to relax while still maintaining privacy for everyone. Everything in the house worked perfectly. We couldn't have been happier with the arrangement. I don't usually write reviews but this place was just perfect. It was my 40th birthday weekend gathering with a bunch of friends and kids. The registration and check in process could not have been easier and more convenient. The place was perfectly organized and stocked with everything you could think of. You could tell that a lot of care has gone into decorating and maintaining this house. The reviews were absolutely right about the kitchen being a perfect chef's kitchen! We couldn't believe how well stocked it was. We really enjoyed our stay here and I highly recommend this property. Recommended for: Families with Young Children, Girls Getaway, Age 55+, Romantic Getaway. We had such a great time at the Wine Country Ranch. We had a 9 friends gather for a weekend of wine tasting and fun. The owner met us, got us set up and we had a great time utilizing all the great resources set up at this house. We had dinners out planned for every night, but ended up changing our minds most evenings and just cooking and hanging out at the property. We hope to come back again someday. We had such a great time at the Wine Country Ranch. We had a 9 friends gather for a weekend of wine tasting and fun. The Mayastoga host met us, got us set up and we had a great time utilizing all the great resources set up at this house. We had dinners out planned for every night, but ended up changing our minds most evenings and just cooking and hanging out at the property. We hope to come back again someday. This house is even more amazing than it looks in the photos. We had six couples and there was plenty of space both indoors and out. Not one detail has been overlooked. From the furniture, to the pool, to the huge gourmet kitchen, it's the kind of place you never want to leave. The property is expansive and setting beautiful. It's only about an 8 minute drive to Calistoga which has plenty of restaurants, shopping and groceries. The owner, Arthur, was wonderful too. He was very responsive and helpful throughout the process and greeted us at the home when we arrived. This was our sixth time renting a home in wine country and we've rented countless other vacation properties. This house goes straight to the top of the list and we've already decided we're going back next fall! This house is even more amazing than it looks in the photos. We had six couples and there was plenty of space both indoors and out. Not one detail has been overlooked. From the furniture, to the pool, to the huge gourmet kitchen, it's the kind of place you never want to leave. The property is expansive and setting beautiful. It's only about an 8 minute drive to Calistoga which has plenty of restaurants, shopping and groceries. The owner, Arthur, was wonderful too. He was very responsive and helpful throughout the process and greeted us at the home when we arrived. This was our sixth time renting a home in wine country and we've rented countless other vacation properties. This house goes straight to the top of the list and we've already decided we're going back next fall! We loved every minute of The Calistoga Wine Country Ranch. The house was perfect for our 3 families - kids (4 and 7 years olds), parents and even grandparents! The kitchen was stocked with everything from condiments to a blender, waffle maker, and even a Miele coffee machine! It's a cook's dream kitchen! We ended up canceling 2 dinners just to stay in and enjoy the grill, fire pit and outdoor deck. Every evening the deers, jack rabbits would wonder onto the the property which delighted the kids. Arthur is the most organized, sweet, and attentive house owner we ever had. We have rented many houses America and Europe and this house was by far the best!!! We cannot wait to return again! I spent a few days here with some girlfriends...my third time to visit...and I cannot wait to go back. The house is large yet SO warm and comfortable. Multiple seating areas, big and small. Anything you need to cook a wonderful meal onsite is at at your fingertips. The pool is perfect...you feel like you're at a spa. The beds are unbelievably comfortable, the entire place is spotless and it's so easy to slip into true vacation mode when you're there. The location is unreal...a quick drive to any and all of the surrounding towns. Eating, shopping, wineries, hiking...it is all right there. A true paradise. Recommended for: Sightseeing, Girls Getaway, Adventure Seekers, Romantic Getaway. Just returned from staying at this property with 4 other couples. It is simply perfect. It is decorated and appointed perfectly. Very comfortable for a large group, because it has multiple sitting areas. The kitchen is AMAZING. I have already referred the property to two friends who happen to be looking for a place to rent in the area!! We've been traveling to the wine country for over a decade and now we can bring friends to enjoy paradise. We've enjoyed this property now for the 4th year in a row. The property gets even more beautiful with each visit. Well-appointed, inviting, relaxing and CLEAN. We are always torn between staying in to enjoy the house or go out for wine tasting? You're greeted daily with wildlife and the scent of the rolling hills. Enjoy it all by the fire pit, the pool or a leisurely stroll to the tennis courts. This house is a "don't miss" opportunity! Rooms are super comfortable, towels, sheets, amenities, all in there. I can be here all day writing.... anyways, OUTSTANDING! Starting with the owner hospitality; who received us and gave us a tour around all the property; Explain how to use all the appliances and really flexible. The property is extremely well equipped and organized; specifically the kitchen. What a kitchen! Every single cooking instrument you can mention, is there. Even onion glasses, so don't cry!!!!! LOL Rooms are super comfortable, towels, sheets, amenities, all in there. The entire house in modern style, beautiful pool, BBQ, chimney, sound system... I can be here all day writing.... anyways, OUTSTANDING! Thanks Arthur!!!!! hope we can visit again in the near future... Cheers! Recommended for: People with Disabilities, Families with Young Children, Pet-friendly, Girls Getaway, Adventure Seekers, Age 55+, Romantic Getaway, Families with Teenagers. The ranch-style home, and the 17-acre property where it is located are absolutely exquisite. The home has 6 bedrooms, each with it's own bathroom; 4 separate indoor "sitting areas;" large dining room, large gourmet kitchen; 2 laundry rooms; pool; hot tub; outdoor seating/lounging areas; fire pit; tennis court; hiking trails walking distance from the house; and extremely private. The owner is extremely accommodating and easy to work with. We were there with 2 families (4 adults and 6 kids ages 8-15) and the house was large enough to easily accommodate us all. I would highly recommend this property. Quite possibly the most well-stocked vacation home you could ever find - they even have a strawberry topper and cake stands! When you have strawberry toppers and cake stands in a gloriously large kitchen, you know you're set for your vacation. The house comfortably sleeps 14, and it's possible to do your own thing without impinging on others. There were multiple days where we just hung out at the house and enjoyed the pool. If you need anything, Calistoga is just 10 minutes away by car. There are multiple good wineries and restaurants around the area, and the Petrified Forest park was quite interesting too. The house itself is modern and well designed, and the wifi and in-house sound system was seamless. Arthur is a conscientious and understanding host, and I thoroughly enjoyed working with him. Quite possibly the most well-stocked vacation home you could ever find - they even have a strawberry topper and cake stands! When you have strawberry toppers and cake stands in a gloriously large kitchen, you know you're set for your vacation. The house comfortably sleeps 14, and it's possible to do your own thing without impinging on others. There were multiple days where we just hung out at the house and enjoyed the pool. If you need anything, Calistoga is just 10 minutes away by car. There are multiple good wineries and restaurants around the area, and the Petrified Forest park was quite interesting too. The house itself is modern and well designed, and the wifi and in-house sound system was seamless. Arthur is a conscientious and understanding host, and I thoroughly enjoyed working with him. Held my husband's 40th with his closest friends which felt more like a reunion. Arthur's home served as the perfect balance for entertaining both adults and kids. The home is approx 30-45 min away from some amazing wineries and 45 min from Oxbow, downtown Napa. It's very convenient, but once you're at the home make sure you have everything you need because you will not want to leave until check-out. It's private, quiet, and beautiful. An amazing time was had by all. Recommended for: People with Disabilities, Families with Young Children, Sightseeing, Girls Getaway, Age 55+, Families with Teenagers. My wife and I had our wedding at a venue in Napa, and we stayed at the ranch with the rest of the bridal party for an extended weekend. The ranch is a truly amazing place. Everything is extremely well-kept and well thought out. We especially enjoyed the super cool interior design and the new amazing pool. This place is understated modern luxury at its best. The best way to describe it is as a newly renovated 5-star resort, but with all the practical benefits and privacy of a private home. We highly recommend it to everyone seeking a luxury getaway in wine country. My wife and I had our wedding at a venue in Napa, and we stayed at the ranch with the rest of the bridal party for an extended weekend. The ranch is a truly amazing place. Everything is extremely well-kept and well thought out. We especially enjoyed the super cool interior design and the new amazing pool. This place is understated modern luxury at its best. The best way to describe it is as a newly renovated 5-star resort, but with all the practical benefits and privacy of a private home. We highly recommend it to everyone seeking a luxury getaway in wine country. I recently rented this place for a group of friends to celebrate a birthday, and I do not hesitate to recommend this house to anyone looking to visit wine country. Not only is the location is great (very close to "downtown" Calistoga and St. Helena), Arthur has thought about everything to make the house a clean, comfortable and luxurious place to stay. The attention to quality and detail is unbelievable. The heated 2-level pool, outdoor fireplace, outdoor grill, hammock, tree-swing, tennis courts, iPad-controlled indoor/outdoor sound-system, surround-sound entertainment centers and soda machine that dispenses Coke in old-school bottles (!) are some of the amenities we found indispensable. Would give this place 6 stars if I could. Absolutely amazing. Can't wait to go back Arthur! We absolutely loved our stay at this home. The home itself is beautifully furnished, with every detail considered and available to make it a perfect week. We had 3 families with kids - and there was plenty of room for everyone to feel like they had their own space. The outside living space was just as great ... rolling hills, a hammock, and a beautiful pool ... all in a very private setting. We felt like we were alone, yet surrounded with the most wonderful comforts to make it a truly special vacation. I highly recommend this home. My son's wedding brought us to Calistoga at the end of June (2014) - booked the house for the long weekend. It was everything the pictures depict. Well furnished, kitchen well stocked, clean - lovely location. Nothing lacking. Easy 7 min. drive into the Town of Calistoga. Owner very easy to work with. Just a great place! Highly recommend the property. We returned a week ago from an extended wedding weekend stay. What a spectacular place! Our family of 11 adults adored this property, but I think the three young kids (ages 2-4) loved it even more. The pool is fantastic. Solar heated all day long, so it is a pleasant dipping temperature. The "Baja bench" area is perfect for non-swimmers and sunbathers. Most of the non-wedding memories are from time spent lounging around the pool and floating on the mats. This property seems to have been built for entertaining. Everywhere you turn, there are plenty of seats and chairs for impromptu gatherings. One other reviewer said it, but the owner has exquisite modern taste. The artwork is beautiful, the furnishings are gorgeous, and yet it still feels open, clean, and totally luxurious. I'd recommend this treasure to anyone. We had grandparents who would visit us during the day (not staying with us), and they were blown away by our accommodations. Thanks Arthur! Everything from Diana Kroll Pandora playing in the pool area to the fire pit and hanging swing in the front yard made for such a memorable stay. We hope to return!!! We returned a week ago from an extended wedding weekend stay. What a spectacular place! Our family of 11 adults adored this property, but I think the three young kids (ages 2-4) loved it even more. The pool is fantastic. Solar heated all day long, so it is a pleasant dipping temperature. The "Baja bench" area is perfect for non-swimmers and sunbathers. Most of the non-wedding memories are from time spent lounging around the pool and floating on the mats. This property seems to have been built for entertaining. Everywhere you turn, there are plenty of seats and chairs for impromptu gatherings. One other reviewer said it, but the owner has exquisite modern taste. The artwork is beautiful, the furnishings are gorgeous, and yet it still feels open, clean, and totally luxurious. I'd recommend this treasure to anyone. We had grandparents who would visit us during the day (not staying with us), and they were blown away by our accommodations. Thanks Arthur! Everything from Diana Kroll Pandora playing in the pool area to the fire pit and hanging swing in the front yard made for such a memorable stay. We hope to return!!! This property would honestly be pretty perfect for just about any get away: vacationing families, couples retreat, wine country adventure, family reunions etc... but we chose to host our small wedding here and it was nothing short of amazing! The property owner went above and beyond to ensure that every detail was taken care of prior to our arrival: even going so far as to power wash the driveway himself! We hosted our families- who hadn't met prior to the weekend- at the house and with six large bedroom each with their own bathrooms, it accommodated us all very nicely. Everyone had enough space and felt that they had privacy when needed and with several communal areas could also be social when each wanted to as well. The setting for the ceremony and reception was gorgeous and the large property provided room enough for guests to move easily from one location to the next providing them with a truly unique yet intimate experience. As mentioned, we had family in from out of town and the goal was to provide an authentic Napa valley/wine country atmosphere: Something elegant but unpretentious and that is exactly how everyone: family and friends alike described their experience. Each and every guest raved about how beautiful the property was and how well appointed the house itself is. (The homeowner has really spectacular taste). We can't say enough about how great our experience was with both the property as well as the homeowner himself. We can't wait to stay again!!! This property would honestly be pretty perfect for just about any get away: vacationing families, couples retreat, wine country adventure, family reunions etc... but we chose to host our small wedding here and it was nothing short of amazing! The property owner went above and beyond to ensure that every detail was taken care of prior to our arrival: even going so far as to power wash the driveway himself! We hosted our families- who hadn't met prior to the weekend- at the house and with six large bedroom each with their own bathrooms, it accommodated us all very nicely. Everyone had enough space and felt that they had privacy when needed and with several communal areas could also be social when each wanted to as well. The setting for the ceremony and reception was gorgeous and the large property provided room enough for guests to move easily from one location to the next providing them with a truly unique yet intimate experience. As mentioned, we had family in from out of town and the goal was to provide an authentic Napa valley/wine country atmosphere: Something elegant but unpretentious and that is exactly how everyone: family and friends alike described their experience. Each and every guest raved about how beautiful the property was and how well appointed the house itself is. (The homeowner has really spectacular taste). We can't say enough about how great our experience was with both the property as well as the homeowner himself. We can't wait to stay again!!! This house is as great as the pictures show. We had six couples stay here, and the house served all of us very well. This location served as our base for our Napa and Sonoma winery visits. While a bit of a drive, the rental was a great oasis to return to. The kitchen is outstanding. Recommended for: Girls Getaway, Age 55+, Romantic Getaway. This house leaves nothing to be desired. The inside is well laid out-- 3 bedrooms and bathrooms on one wing and 3 bedrooms and bathrooms on an opposite wing so noone felt on top of one another. The house is well-stocked from hairdryers and more than enough towels in every bathroom to ample laundry detergent, a full-stocked kitchen, and tennis rackets and balls with which to hit. It is also fully wired. There are many different areas around the inside and outside of the house that make it relaxing and private if that's what you'd like. The house is in outstanding condition- in fact the pictures don't do the interior or exterior justice. This house leaves nothing to be desired. The inside is well laid out-- 3 bedrooms and bathrooms on one wing and 3 bedrooms and bathrooms on an opposite wing so noone felt on top of one another. The house is well-stocked from hairdryers and more than enough towels in every bathroom to ample laundry detergent, a full-stocked kitchen, and tennis rackets and balls with which to hit. It is also fully wired. There are many different areas around the inside and outside of the house that make it relaxing and private if that's what you'd like. The house is in outstanding condition- in fact the pictures don't do the interior or exterior justice. We rented this house over the summer to celebrate our mother's 65th birthday. In short it was an AMAZING vacation. We had a group of 8 adults and 5 children all under the age of 5 and it was the perfect rental for us. The home is gorgeous, modern, and had plenty of space to accommodate the whole group. We loved the large kitchen, having 2 dishwashers was a great perk! We had been looking for a vacation rental where we could entertain the whole family without leaving the property (not always easy with the amount of little ones we had with us), this home hit the mark. We spent the week swimming, taking nature walks, and exploring the property. It was great to be able to spend so much time outdoors, waking up to have coffee on the deck while watching the deer wander by, afternoons in the pool, and sitting by the fire pit at night after having had dinner outside. Arthur was very accommodating and helpful as well. We hope to return to this property again in the future. I have been remiss on not writing this review earlier. We stayed at Arthur's magnificent house last summer for a week and enjoyed the week very much. In fact we never ended up leaving the house it was so great. We had 3 couples in the group each with children. Everything from the tennis courts to the pool to the hammock were spectacular. Inside is very modern and there is plenty of space outside to read a book or enjoy the company of others. Definitely a great find! Rishi. I have been remiss on not writing this review earlier. We stayed at Arthur's magnificent house last summer for a week and enjoyed the week very much. In fact we never ended up leaving the house it was so great. We had 3 couples in the group each with children. Everything from the tennis courts to the pool to the hammock were spectacular. Inside is very modern and there is plenty of space outside to read a book or enjoy the company of others. Definitely a great find!